By all appearances, it's just two players taking turns laying stones on a 19×19 (or smaller) grid of intersections. But once its basic rules are understood, Go shows its staggering depth. One can see why many people say it's one of the most elegant brain-burning abstract games in history, with players trying to claim territory by walling off sections of the board and surrounding each other's stones. The game doesn't end until the board fills up, or, more often, when both players agree to end it, at which time whoever controls the most territory wins. 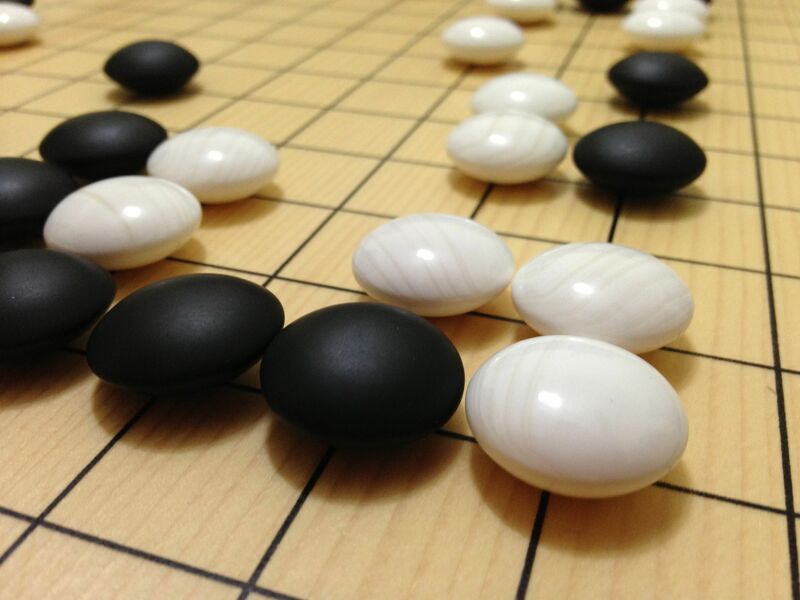 The earliest mention of Go (åæ£ (wéi qí)- "surrounding game") appears in the "Analects" of Confucius (551-479 BC), while the earliest physical evidence is a 17×17 Go board discovered in 1952 in a tomb of the former Han dynasty (206 BC- 9 AD). There is a tangle of conflicting popular and scholarly anecdotes attributing its invention to two Chinese emperors, an imperial vassal and court astrologers. One story has it that Go was invented by the legendary Emperor Yao (ruled 2357-2256 BC) as an amusement for his idiot son. A second claims that the Emperor Shun (ruled 2255-2205 BC) created the game in hopes of improving his weak-minded son's mental prowess. A third says the person named Wu, a vassal of the Emperor Jie (ruled 1818-1766 BC), invented Go (as well as games of cards). Finally, a fourth story suggests that Go was developed by court astrologers during the Zhou dynasty (1045-255 BC). A Go set, consisting of a very general-purpose grid and colored stones, can also be used to play a variety of other abstract strategy games, such as Connect6, Go-Moku, Pente, and others.